On the Moroccan beaches, near Tangier or Casablanca, the dunes have disappeared, leaving a lunar landscape. They were not destroyed by storms, but stolen night after night by squads of trucks, to build vacation homes for the tourists who come for the coast’s warm waters and soft sands. For many years now the Caribbean has been a victim of the same phenomenon, from Jamaica to Barbuda, the beaches have shrunk. The pillaging of sand is a growing practice in the world. Taken by hand, three or four meters deep in the Maldives archipelago and transported on a donkey, or sucked up by huge sand boats in Asia, coastal sand mining, authorized or unlawful, is exploding. Sand, the second most important natural resource in the world after water, is present in a number of products, from glass to microprocessors. However, it is because it represents 80% of the composition of concrete that it is the object of such greed. 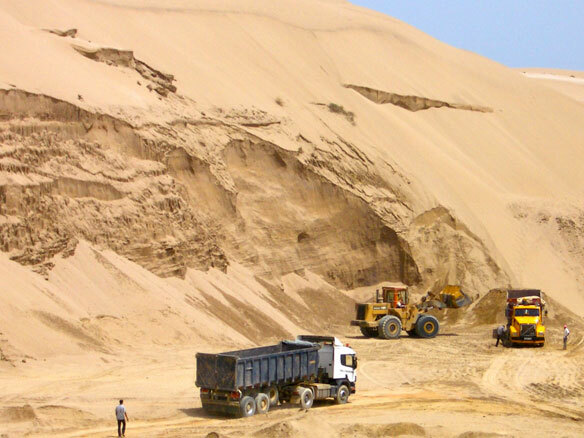 Because of the construction boom, sand quarries are no longer sufficient. Already over-exploited, or subject to stringent environmental regulations in developed countries, they are also becoming more expensive. Taking sand from the shore or the foreshore has become an increasingly common practice. However, it has particularly brutal repercussions, not only for the deep-sea ecosystem and fishing, but also for the coast where the erosion has been accelerating. The withdrawal of the coastline is proving catastrophic: increased storms, floods and the infiltration of seawater in freshwater bodies. Some governments have started fighting against this phenomenon. 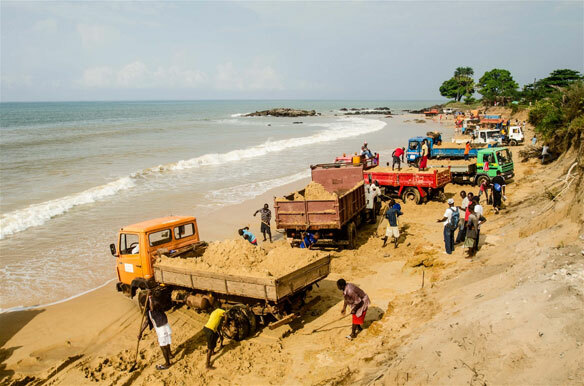 In mid-May, Liberia’s Mines and Energy Ministry arrested men who were “helping themselves” illegally to sand on the beaches around Monrovia. The police operation took place in front of the press, as did the restitution of the “booty” that was stolen: sand destined for brickmaking. The Liberian government signaled a clear message that those who break the law banning beach sand mining must be prosecuted and their equipment confiscated. A big part of the African continent is affected by sand theft. Benin has closed its coastal deposits. But in Sierra Leone, which is under the impetus of reconstruction after years of civil war, trucks have, unlawfully, invaded the beaches. Senegal has also banned taking sand from most of its coastline. But these measures are rarely respected. Around Dakar and Saint-Louis, coastal protection committees struggle to stop the pillaging. The problem is that only one wheelbarrow is enough to carry a quantity of sand worth from 2,000 to 4,000 CFA francs (three to six euros). Local organizations are multiplying, but have not been able to unite their efforts. 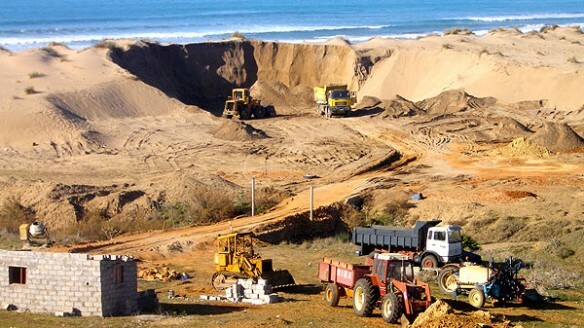 The U.S. organization Coastal Care has documented cases of illegal exploitation in some 60 countries and launched a petition calling for the end of coastal sand mining. Not only to save the beaches, says the organization’s director, Claire Le Guern, but also for the people who are forced to collect sand from dawn until sunset, notably Haitians in the Dominican Republic. Sand mining is even more present in Asia, where demographic pressure and economic development force cities to extend toward the sea. The island of Singapore has grown by 20% since the 1960s, by taking sand from its neighboring countries. In response, Indonesia, Malaysia, Cambodia and Vietnam have banned the export of sand toward the greedy country. Smugglers have taken over the market. “We were able to board one of the boats of the sand pirates, who came from Cambodia,” says Denis Delestrac, the author of the documentary, Le Sable, enquete sur une disparition (“Sand-Wars”, investigation into sand disappearance”). Another example: the artificial islands of Dubai, which required a massive quantity of sand, favored by the low cost of shipping. Desert sand, too thin and too round was not suitable. “The Palm and the World islands required at least 600 million tons of sand, representing more than the total annual French sand production,” says Eric Chaumillon, a marine geologist. “People have been removing natural resources for a very long time,” adds Chaumillon. “But this will continue to increase. We are lagging in our knowledge of the consequences of sedimentary exchanges between the shore and the foreshore. Sandbars are moving, but we are not able to quantify these fluxes,” he explains. As a result, storms can be devastating for communities living on the coast. “Men shouldn’t try to play sorcery’s apprentice,” concludes the marine geologist.